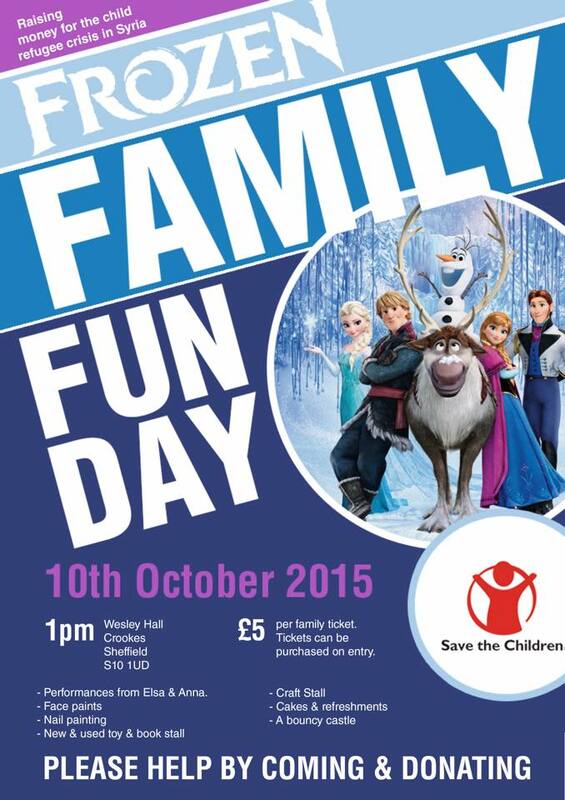 A local volunteer is organising a Frozen Family Fun Day in aid of the Save the Children child refugee appeal. The family day out organised by Donna Fyfe will run 1-4pm on 10 October 2015 at Wesley Hall in Crookes, Sheffield, S10 1UD. Family tickets priced £5 will be available on the door. There will be live performances from Queen Elsa and Princess Anna, face and nail painting, a bouncy castle, raffle, as well as cake and craft stalls, other activities and performances will all be manned by a band of willing volunteers. Cash donations can be made via our Just Giving page at www.justgiving.com/Frozen-Family-Fun-Day or contact Donna on 07885 427076 or donnamayfyfe@gmail.com if you want to contribute to the raffle. This entry was posted in charity, events and tagged crookes, family fun day, frozen. Bookmark the permalink.